Get the answers you need to start planning your trip to Waikiki, from hotel information ways to get around the island and more. 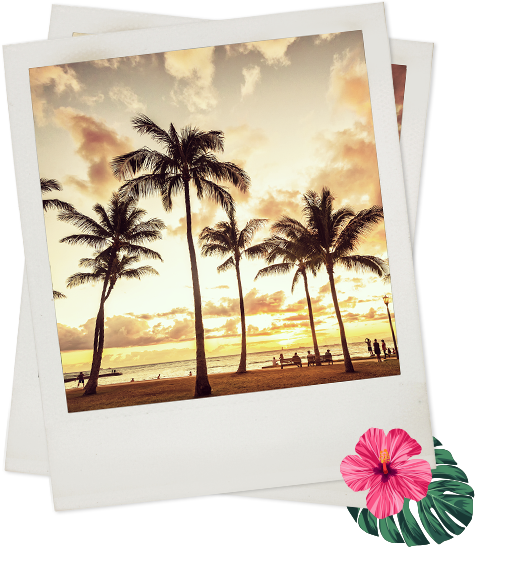 We prepare you to Waikiki like a local. Royal Grove Waikiki does not offer guest parking. The Aqua Pacific Monarch located across the street from our hotel provides parking for $30 plus tax per vehicle per day. The Aston at Waikiki Banyan, a five-minute walk, provides parking for $30 plus per vehicle per day. Early check-in is not guaranteed but we will be happy to provide you with early check-in should we have rooms available. Late check-out is not guaranteed, but is available upon request up to 1:00 pm at no additional cost. Any check-outs after 1:00 pm will be considered an additional night’s charge. Luggage storage is available at the front desk, subject to availability. For any Groups, please contact the hotel 72 hours before the date of arrival to arrange for storage. 2) Taxi: Located street level directly outside of the baggage claim area at the center medium guests can find taxis that will transport them directly to the hotel. A typical fare ranges from $35 to $50. However, this fare can be higher during peak traffic times. 3) Rideshare: Request a ride from Uber or Lyft when you’re ready to walk outside of the airport, then head to a designated rideshare pickup zone. Do you offer cribs or rollaway beds? Cribs are complimentary and based upon availability. Laundry facilities are located on premises on the first floor. They are coin operated and the user is responsible for any costs. Change is provided at the Front Desk. Laundry soap is also available for purchase at the Front Desk. This is a non-smoking hotel. A $500 fee will be charged for smoking in the room. We gladly welcome service animals. There is no restaurant in the hotel, however, there are several restaurants adjacent to and near the hotel.